By using containers to garden in, you can plant almost anywhere! 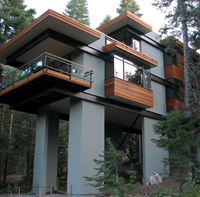 Narrow walkways, ledges, and decks - houseboats, rooftop apartments and mobile homes all have their own unique considerations. There are many places where growing plants, flowers or herbs just isn't reasonable or possible. This is the perfect time to get creative when selecting a crop to grow and the container to grow them in. 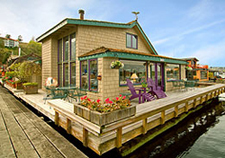 People who live on houseboats have the problem of no natural lawn or soil to plant in. Since containers come in all shapes and sizes it is easy to find the planter that will work good for you. Because of the natural water source placement can pretty much be anywhere and if decks are narrow just use a rectangular planter that fits. Perhaps you live in a downtown urban condo where soil and lawn does not exist. If you use large enough containers you can plant trees or large bushes. They can easily create the feeling of a garden setting by placing the contained trees in a spot to block the surrounding buildings. Plants overflowing with colorful flowers are really beautiful in this type of harsh setting. Just make sure your water souce is handy. Narrow walkways are a common problem with today's developments. Since space is a premium, the builders don't give you much room to work with when it comes to front door space. 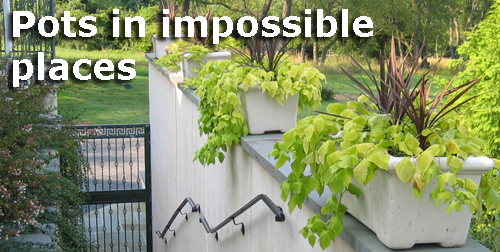 Some homes have side entrances where it is almost impossible to grow plants or flowers. If you use a rectangular planter box it helps to utilize most of these small space areas. Mobile homes, beach houses and homes built among trees are all unusual situations that need special care. Just take into consider the amount of weight the planter can hold - especially if you are on a deck. Then figure out what you will use for water source so that you can locate the container as close to it as possible.